In mid May we will be mainly fishing for walleyes, hopefully we will get perch and pike as well maybe crappies. The musky are a little slow in the colder water we do get a few in May when walleye fishing they are as likely to hit small baits that you would use for smallmouth and walleye. 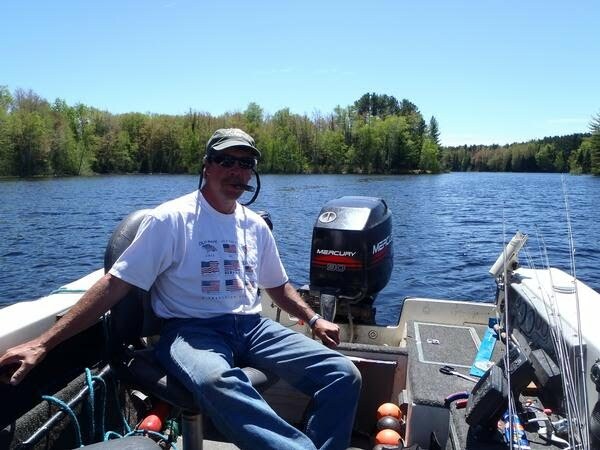 When I am guiding with three people in the boat we mainly jig and slip bobber (Stan's) fish it is a little harder to cast crank baits with three and myself in the boat. Casting baits is a fun way to catch fish however and if you want to buy some baits I'll give you a short list of some I like the best for that time of year. Rapala makes a lot of good baits they have some new ones out I haven't tried yet but some that have been around a long time and are proven fish catchers are the count downs, shad raps and definitely one of my favorite baits the jointed count downs. I have a tackle box full of baits but if I were coming up here and wanted to have a selection but not spend too much I would buy two #9 count downs one black and gold and one black and silver, two #5 shad raps one perch colored and one I think they call crawfish color ( it is a brown color on top and orange on bottom) and two J-9 (Jointed # 9 count downs) both in perch color. One sometimes very good color is the fire tiger I would want one of those in the shad rap if I were going to buy six baits I would trade out the perch shad rap for a fire tiger. A bait that does very well sometimes will out perform the rapalas actually outperform them buy a lot some days are Salmo Hornets but they aren't cheap. I did real well on the hornet 4F in a color that looked like a perch. Another bait to consider are the flicker shads by Berkley they look like a rapala shad rap they make them in similar colors to the ones mentioned above the # 4's go down around 6-8'. These baits also work well and are priced lower then the rapalas. An interesting side note on these baits is that they were developed by one of the best walleye fisherman in the country who did the prototype work on the Turtle Flambeau Flowage. If you want to cast for pike and maybe musky in shallow bays I would pick up a few #4 mepps spinners I like the black and gold one called "black fury". For casting baits you want to have heavy enough line to get your bait off a snag but if too heavy it impedes the action of the bait and does not allow the bait to go deep enough on the retrieve,10lb. mono is about right no heavier. For jigging rods I use 6lb. Berkley XL. For live bait fishing 1/16 and 1/8 oz. jigs orange and chartreuse are good colors. The jigs that I have found to work the best are slow fall jigs but you won't find them in any chain stores both sport shops in Mercer have them. 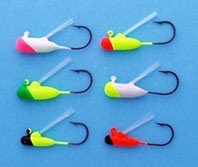 You also want to pick up some Stan's Slip Bobbers and slip bobber knots and small split shots. I buy Stan's Slip Bobbers at fleet farm in packs you lose some of them to snags it doesn't pay to buy expensive thill bobbers with beads. Like I said casting bait is a fun way to catch fish but there are a lot of snags on a flowage and you will lose some baits. If the other guys also like to cast you might want to buy a "de-snagger" the one I bought from cabelas a few years ago was only 20-25 dollars it is a telescoping rod with a spiral wire on the end . You wind the spiral around the line and extend the rod under the water to unhook the bait from the log or stump that it is hooked on. Often a jig and live bait will outperform artificial lures and is actually how I do a high percentage of my fishing when guiding. You wouldn't need to buy anything more then jigs and you will catch fish. Some people do like the action of casting lures and it is a good way to cover water faster and try to find some active fish.